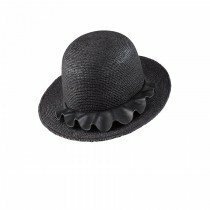 Soft supple leather ruffles combine with Helen Kaminski's hallmark raffia crochet to bring the Andalusia Round Crown hat to life. Finished with an inner size adjustable band and signature seed insignia, this on trend style bring an effortless sophistication to any spring / summer look. Styles can be adjusted with either a hand rolled raffia string around the crown or inner band and tie. You can expect to reduce the size by 1 - 2cm*.